Background: We developed, applied, and prospectively evaluated a novel deep-inspiration breath-hold (DIBH) screening and delivery technique to optimize cardiac sparing in left-breast radiotherapy (RT) at our clinic. The impact of set-up and dose variables upon organs at risk (OAR) dose in DIBH RT was investigated. Methods and materials: All patients with left-breast cancer referred between 2011 and 2014 – of all disease stages, set-up variations, and dose prescriptions – were included. Radiographers used simple screening criteria at CT simulation, to systematically assess patients for obvious DIBH benefit and capability. Selected patients received forward-planned intensity-modulated RT (IMRT) based on a DIBH CT scan. 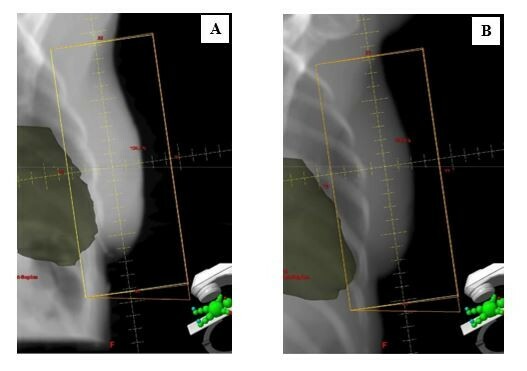 A 3D-surface monitoring system with visual feedback assured reproducible DIBH positioning during gated radiation delivery. Patient, target set-up, and OAR dose information were collected at treatment. Results: Of 272 patients who were screened, 4 withdrew, 56 showed no obvious advantage, and 56 showed benefit but had suitability issues; 156 patients were selected and successfully completed DIBH treatment. The technique was compatible with complex set-up and optimal target coverage was maintained. Comparison of free-breathing (FB) and DIBH treatment plans in the first five patients enrolled confirmed DIBH reduced heart radiation by ~80% (p = 0.032). Low OAR doses were achieved overall: the mean (95% confidence interval [CI]) heart dose was 1.17 (1.12–1.22) Gy, and the mean ipsilateral lung dose was 5.26 (5.01–5.52) Gy. Patients who underwent a standard radiation schedule (40 Gy/15#) after breast-conserving surgery had the lowest OAR doses: post-mastectomy treatment, simultaneous supraclavicular (SCV) node coverage, and alternative dose schedule (50 Gy/25#) were interrelated variables associated with increased OAR risk and compromised ipsilateral lung dose constraints. Conclusion: The DIBH technique was successfully implemented and resulted in optimally low heart radiation. All patients who demonstrate sufficient DIBH technique at planning CT are now offered DIBH RT at our clinic. Patients with more advanced disease, particularly those with additional pulmonary risk factors, warrant additional focus to improve lung sparing.